Preheat oven to 375°F and line a baking sheet with parchment paper. Begin by cutting 5 strands of twine about 1 foot long and laying them in a web pattern across the baking sheet. Unroll the puff pastry and lay it centered on the twine web. 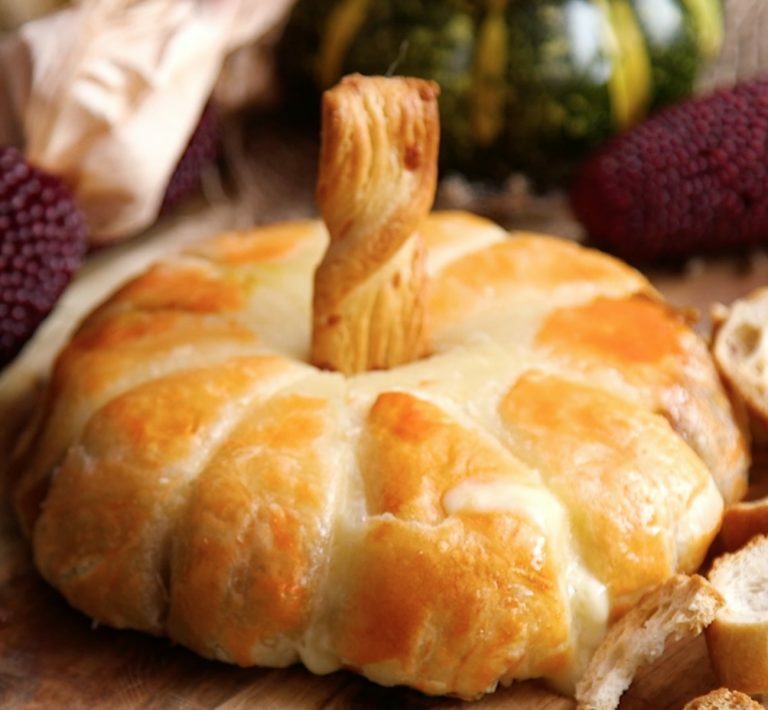 Center the brie on top of the pastry, then evenly spread the pumpkin butter on top of the cheese. Bring the corners of the puff pastry to the middle, gently pinching the edges to seal any openings. Tie the opposite ends of the twine around the center, then flip everything over so the neater side is on the top. In a small bowl, whisk together the egg white with 3 drops of yellow food coloring and 1 drop of red food coloring. Lightly brush this onto the surface of the puff pastry. Bake until golden brown, about 20 minutes. Once removed from oven, allow to cool for a few minutes, then carefully cut and remove the strings. To decorate, cut a small slit in the top center and place a cheese straw in as the “stem,” as well as a sprig of sage for a “leaf.” Serve with crackers or crusty bread. Enjoy!